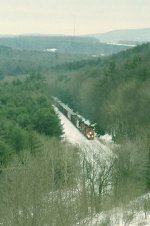 Title: 5750 at adirondack jct. Description: In charge of a train, they wait for the light. 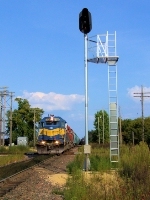 Description: Two light units move from St. Paul to Humboldt yard for a westbound train. Description: Headed to Pocono passing Moscow depot. Description: After spotting the grain train at Pocono, the power will return here for lumber loads & take them to Cresco. Description: Grain train power has returned to Tobyhanna for lumber loads to be taken to Cresco. Description: This power brought a grain train to this spot & is now headed further east to Cresco. Description: Empty train returning from Pocono at Nay Aug Tunnel. Description: Grain train crew ran an extra move to Cresco. Now that's customer service at its finest! Power is returning to Pocono for the empty grain train back to Scranton. Description: DME loaded ethanol train 636-28 sits at Memorial Siding on the west side of town. Description: Three pac-man SD40-2's lead DME train #489-11. Description: Crossing the IC&E/IC&E diamond, 1615 hours. 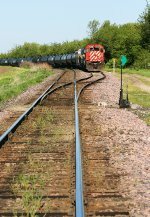 Title: CP 5750 CP's Tomah Sub. Description: Pacman on the Point of Train 486.